Miss V.B. P, 22 years old female (Patient Identification Number - 9133), visited our centre with the complaints of thinning of hairs. There was decrease in growth and quantity of her hair. She was having these complaints since past 5-6 years. Her hair had become dry and scanty. 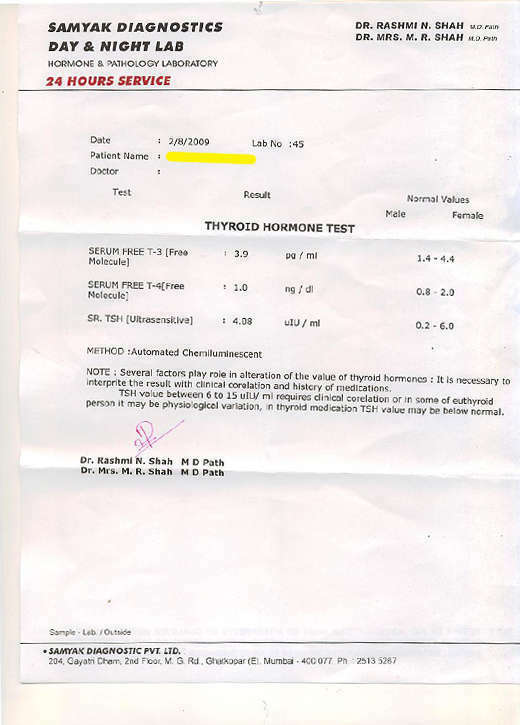 Dr. Shah examined her and advised a Thyroid function test. She was detected as an Under-active Thyroid. TSH – 13.49, T3 – 3.31, T4 – 0.83. There were no other associated complaints. Her appetite was normal with cravings for sweets and chocolates. There were no complaints in thirst and perspiration. The bowels were occasionally constipated, which had increased since past few months. Her sleep was sound and refreshing. There were no menstrual complaint; the cycle was regular and the flow moderate. She lived in a nuclear family with mother, father and younger sister. Her mother was a home maker and father was a businessman. She and her sister were studying Chartered Accountancy. She had a past history of recurrent upper respiratory tract infection which had settled down in the past few years. She once had complaints of bone infection, 16 years back, which was treated by Homeopathy. In her family, there was a strong history of Diabetes Mellitus in her grand parents. Her sister was having complaint of acne. She was reserved by nature. She was sincere and good in studies. She was confident and punctual in her work. Recently she had started becoming impatient and irritable. She was very ambitious in nature, she wanted to become very bin in the corporate sector. Her case was studied in detail by Dr. Shah. She was prescribed Nat Mur 200 C and research based medicines. With 4 months of regular treatment her hair fall showed much improvement. 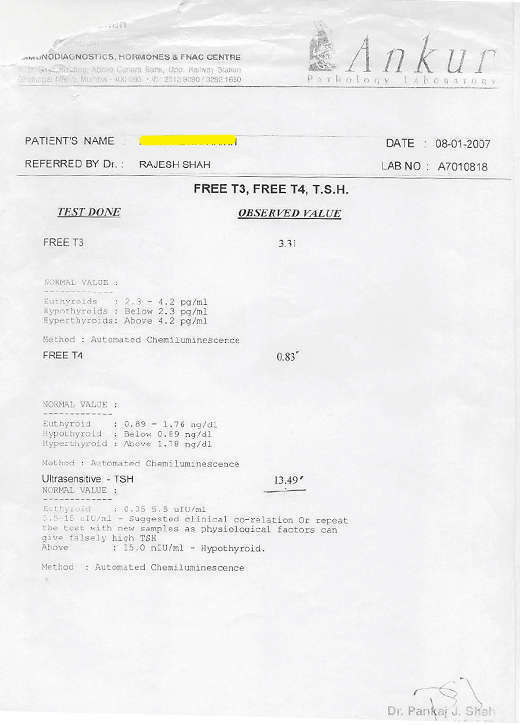 Her Thyroid level had considerably decreased to T3 – 2.90, T4 – 0.60 , TSH – 9.59. With further 4 months of treatment, her hair fall complaints were improved by 90% and her Thyroid levels further improved. 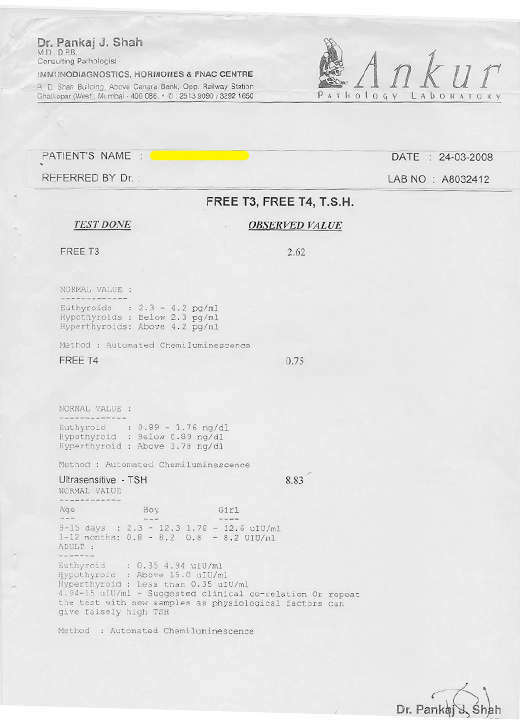 With regular medication under Dr. Shah for 14 months, her thyroid levels were brought within normal limits. Her complaints of hair fall were completely cured. She has been under our care for the past two years. She is regularly evaluated for her Thyroid levels. It is always within permissible limits. Her TSH level was 4.08 in August 2009. She has been healthy and able to cope up with higher responsibilities. Her sister is also under Dr Shah’s treatment for under-active thyroid. Both have shown wonderful recovery with Homeopathy. These cases demonstrate the efficacy of Homeopathy in treating under-active thyroid.